Hello again! This is going to be the last post of the Build Your Own Pool Series. I am going to let you know other details about our backyard in the future, but the pool is almost finished and I have some pretty great things in the works right now. I am excited to share with you what is happening inside the house. 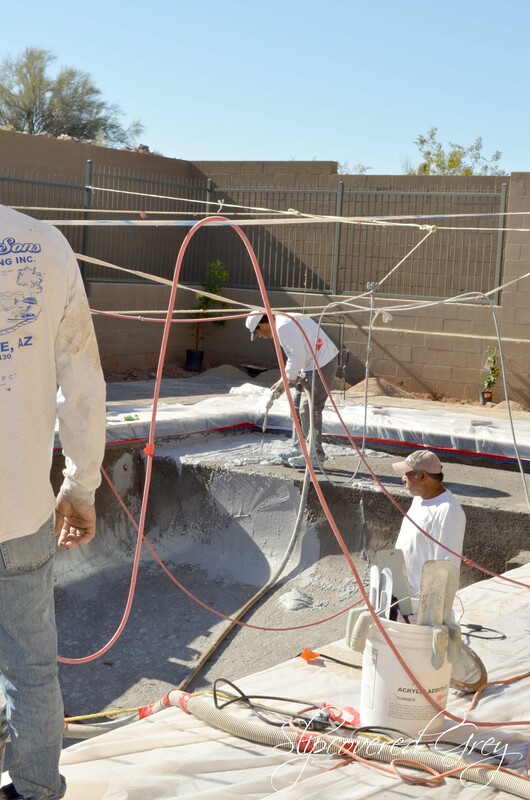 One of the biggest challenges I encountered was pool color. As you know, I love anything French and when I heard of the color “French Grey”, I had to see it in pictures and in person. I scoured the internet for pool colors and always came back to “French Grey”. Ultimately, “French Grey” won the final prize. It is light grey in shallow water and a beautiful crisp blue in deeper water. It’s soft and draws me in every time. There is something about this color that is inviting. This may sound a bit corny, but it’s true, it’s crystal clear and not too blue. When jumping in it feels and looks clean. No green, not too blue, not too dark, just perfect. I had to see this color in person before actually diving into a decision. 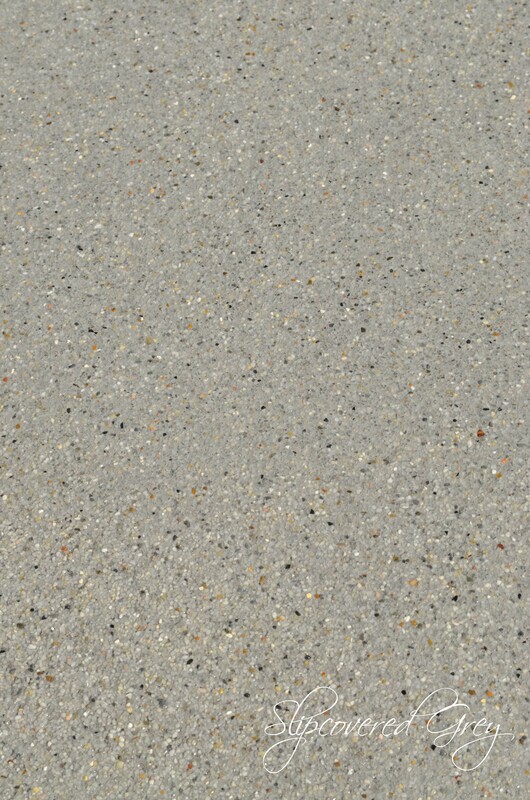 Prado and Son’s (Love them) ,who did our Pebble Sheen, found a pool owner that has this color. They went above and beyond by finding a “live” pool we could view. Prado and Son’s also installed our interior tile. 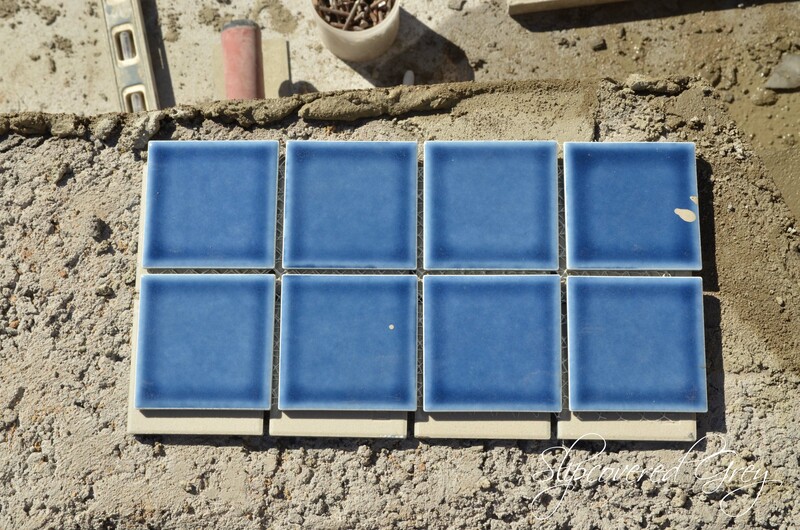 A blue tile was picked to give a resort feel. I visited hotels and looked at hotel/resort photos online. I was drawn to the blue tile and wanted a solid color. 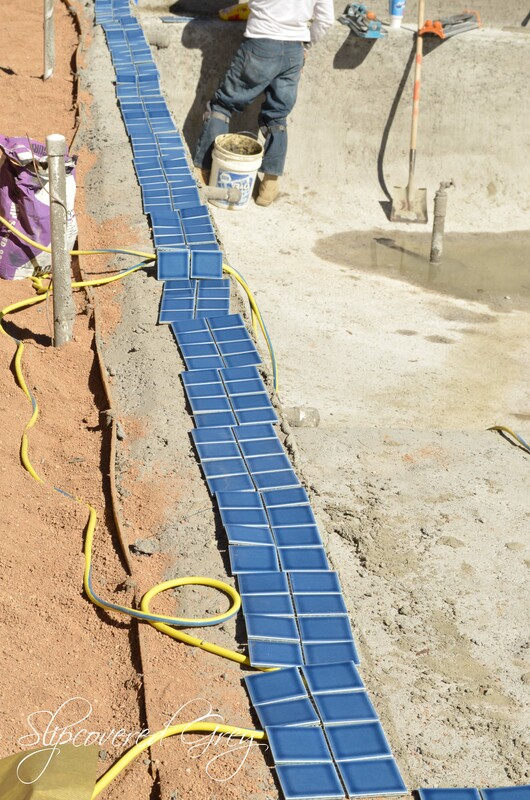 Finding solid pool tile is a challenge… who knew? Once I set eyes on this tile, I knew this was the one. A dark charcoal grey was applied for the grout lines to coordinate with the “French Grey” Pebble Sheen. The coping is a 12×24 travertine in the lightest color I could get my hands on. Here you see it before it was installed. 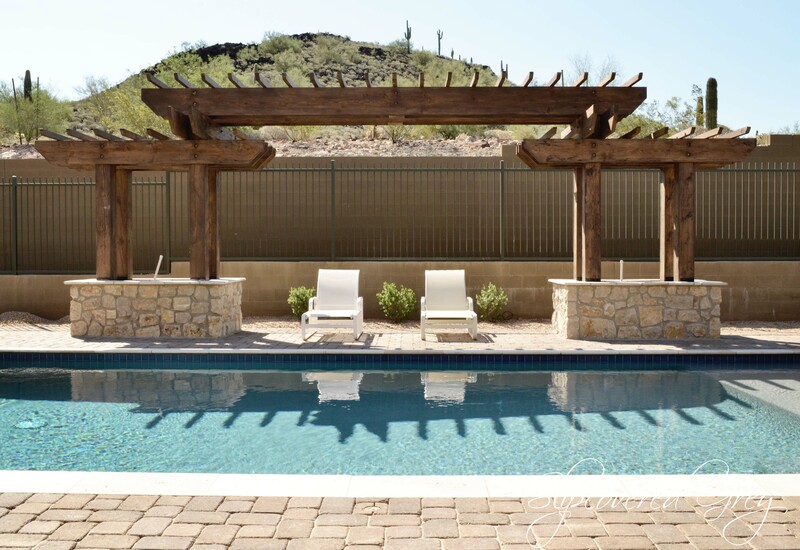 Meeting up to the travertine is Tumbled – Territorial Blend, Phoenix Pavers in a K-Pattern. I wanted the pavers to look like they were old cobblestone sidewalks and streets in France. We chose not to seal them to maintain the antique, light grey finish. Do the pavers get hot? Yes! 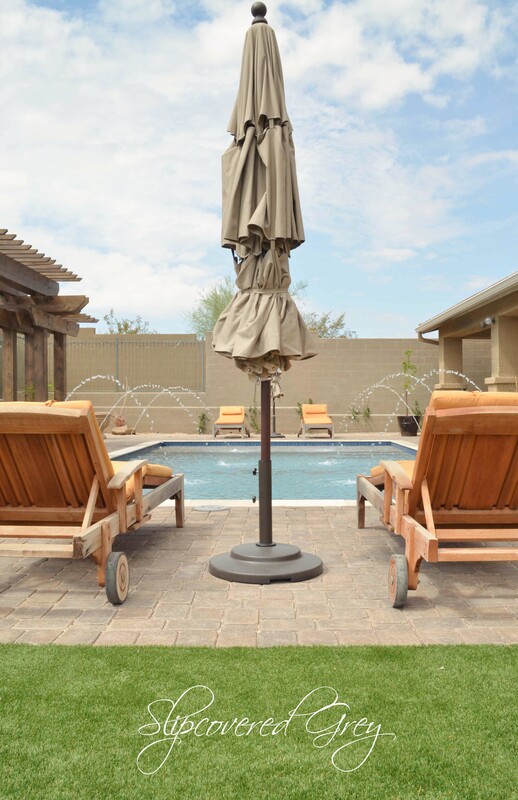 The travertine is much cooler on the feet, but we place our flip-flops close to the pool so we don’t step on the pavers in the baking Arizona sun. Would I choose pavers again? 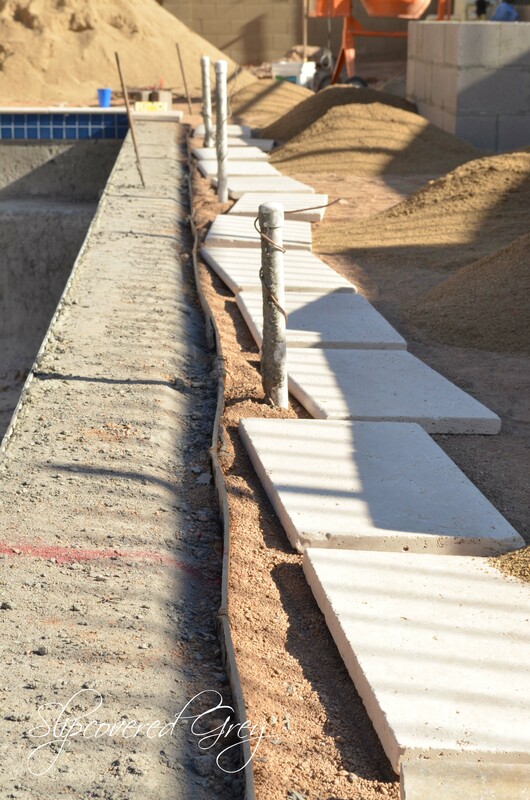 Yes, however, I may opt for a wider coping by using (2) 12×24 pieces of travertine. This would change the look slightly, but give more room for bare feet. After the final safety inspections, the Pebble Sheen (color) was applied. Bring on the “French Grey”. This was the neatest part. It’s a crazy set up and quite a meticulous and important job. See the planter boxes/pergola in the background? The boxes were a DIY project. We were going to DIY the pergola, but because the beams were massive on the pergola, we hired it out. I will share this with you in a later post. We filled the pool with water and the rest is history. Would we build our own pool again? I was able to do everything I wanted and saved in the process. We love creating memories here. I’m thinking Ally likes it a little too. I’m going to jump in the pool. here, here, here, and here. Good morning. I hope you are enjoying the build your own pool series. 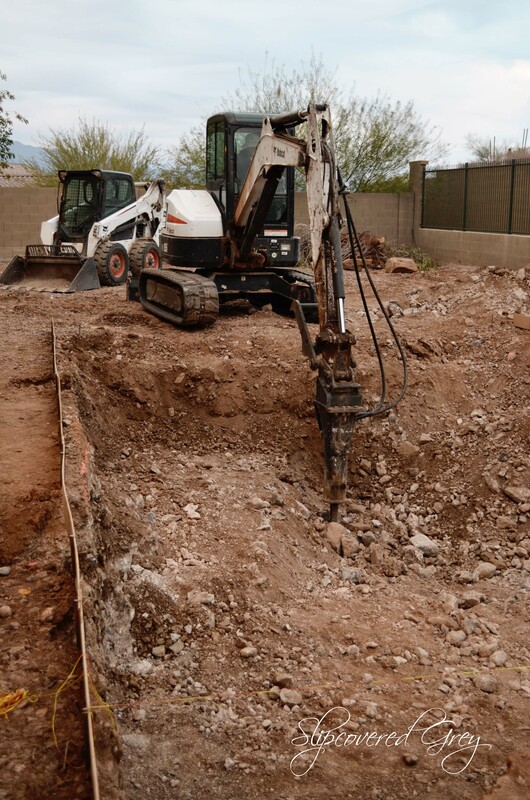 If you aren’t building a pool, I hope you find the process fascinating. While embarking on this pool building journey, I found there wasn’t a place to get step by step details. I spent hours upon hours researching and trying to “figure it all out” as I went. That is why I am creating this mini-series. I won’t get into too much detail, but if you do have questions, I will try to help as much as possible. Also, I am not a pool building pro, just someone who wants to share an experience. 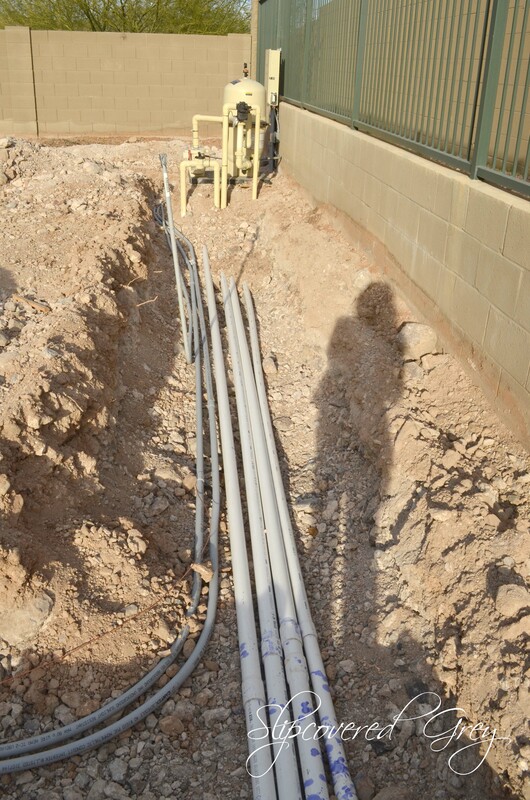 After the dig, we were ready for plumbing. 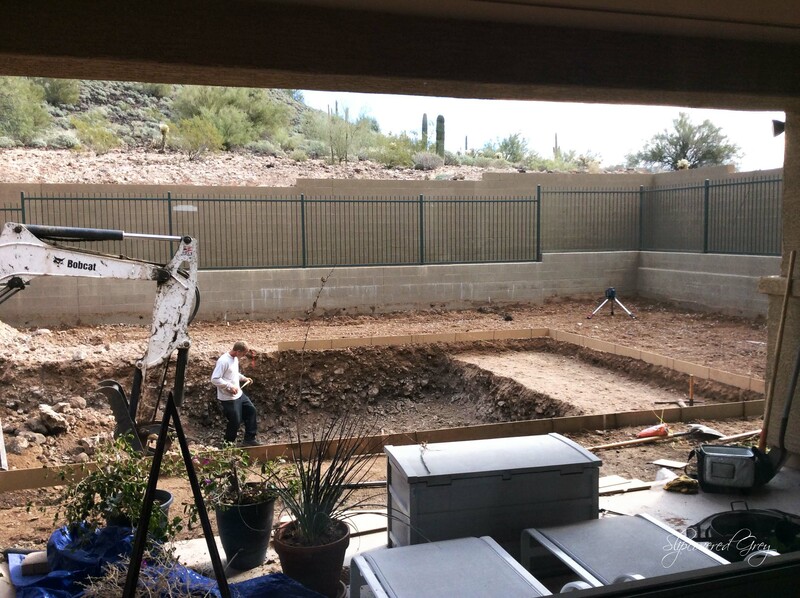 We decided to run plumbing along the back wall instead of a diagonal shot to the pool. In hindsight, I wish we wouldn’t have dug along the back wall. I wasn’t thinking about landscaping. Planting a tree or plant with an expansive root system is impossible here. We had the rebar/steel placed at 6 on 12 for spacing. 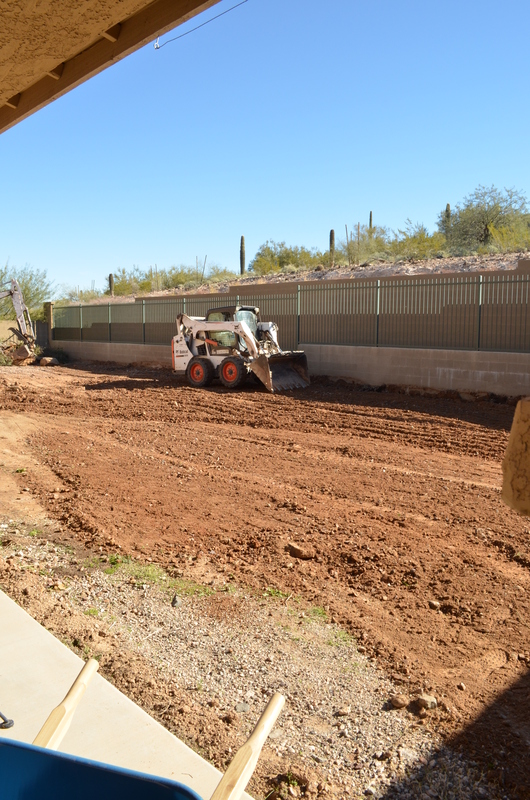 The Arizona recommendation is 12 on 12, but we wanted more reinforcement as we are on the side of a mountain which may have expansive soil. 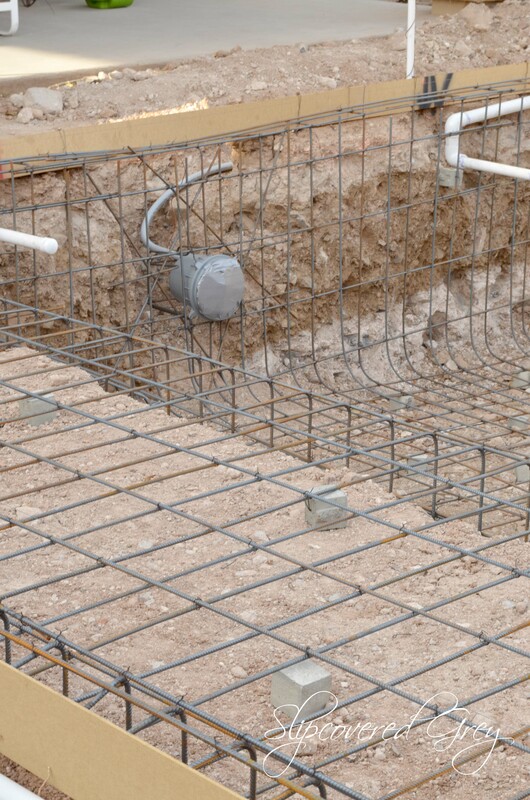 If you would like to read more about rebar/steel check out this website . The next step was electrical. 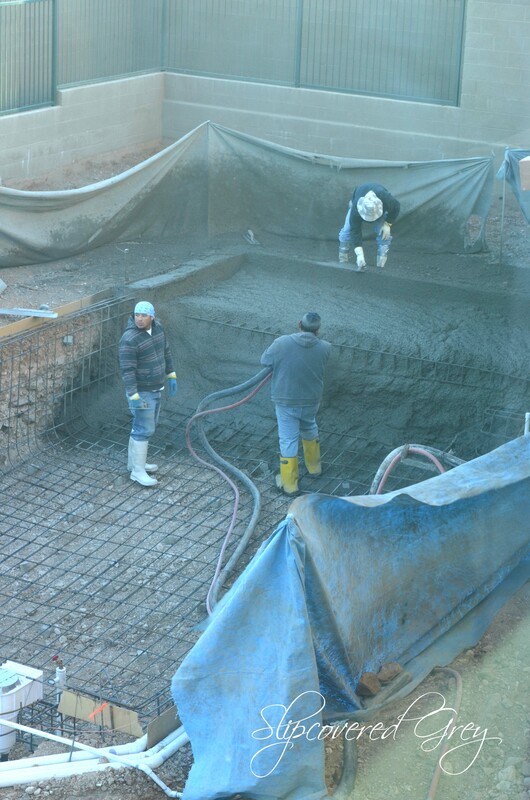 After all of this, a pre-shotcrete inspection was completed. 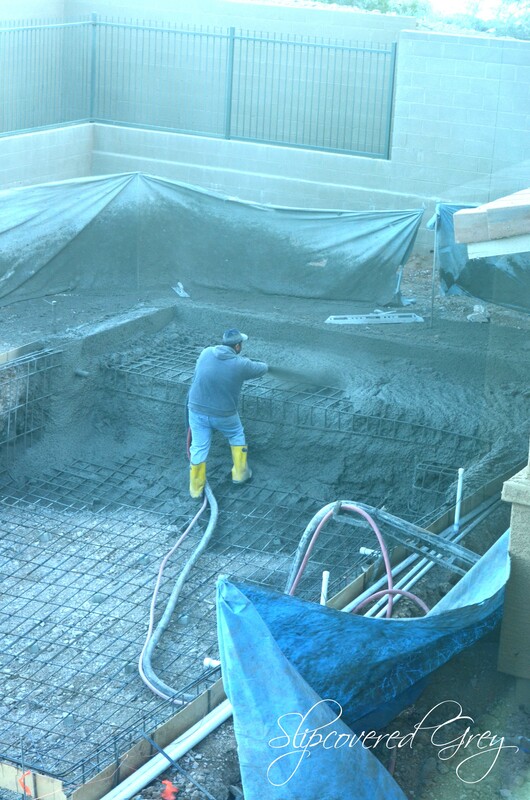 After a pass on the inspection we were ready for shotcrete. This truly is when the pool starts to come to life. It was a very windy day, so these photos are taken from inside the house. This process was quite fascinating to watch. 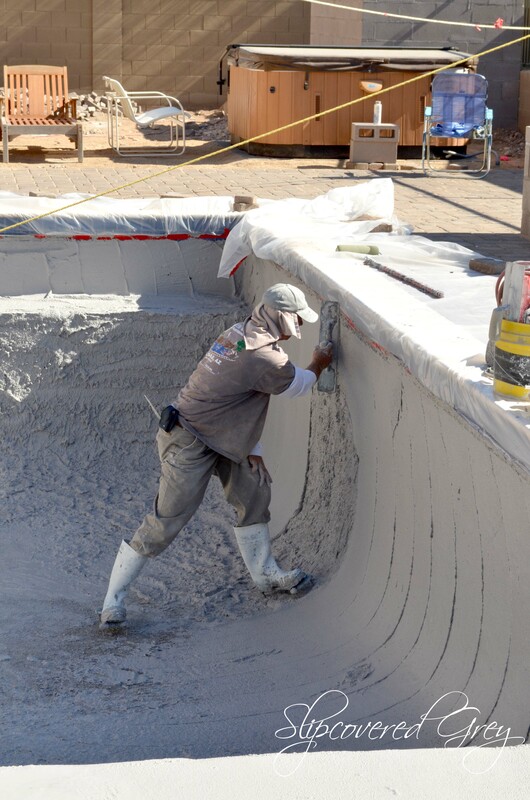 You can see how the surface is smoothed out on the edge of the pool. And, here is the pool – looking like a real pool. Oh yeah, see the water flying in the pool. so it doesn’t dry out and crack. choosing tiles and pool surrounding surfaces. Those decisions are coming soon! you can read about it here and here. 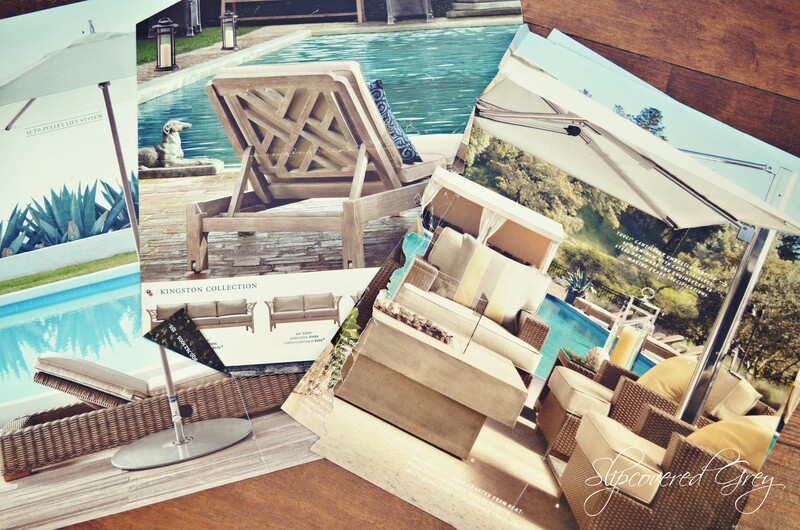 then we can ‘Dive In’ and I’ll show you how we created our backyard oasis. 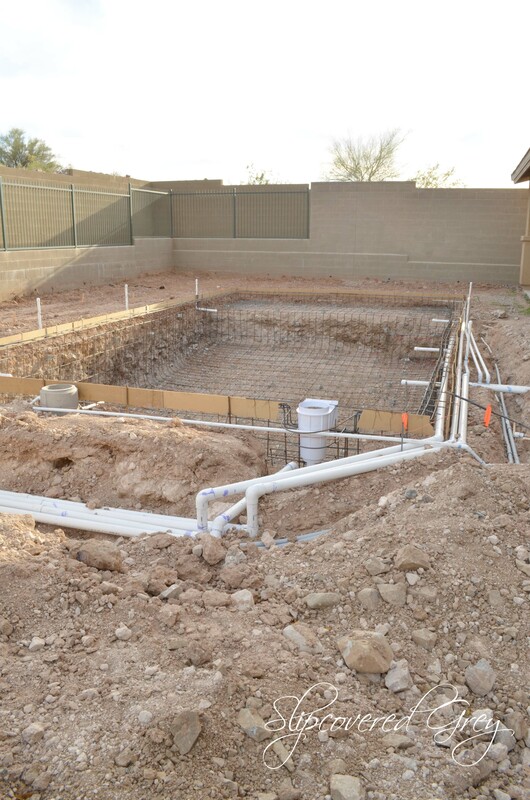 As we walk along this pool building journey together if you are building a pool, I want to help as much as possible. There is so much to think about, and let’s face it, when it is complete, you can’t go back and have a do-over. 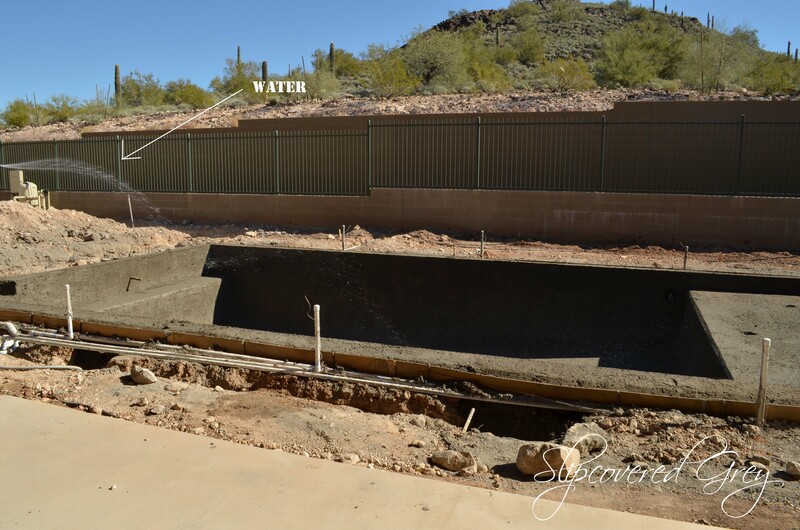 If you aren’t building a pool, but want to see the process, it’s pretty fascinating. I started with a very good idea of what I wanted before I met with anyone. I knew I wanted a simple pool. 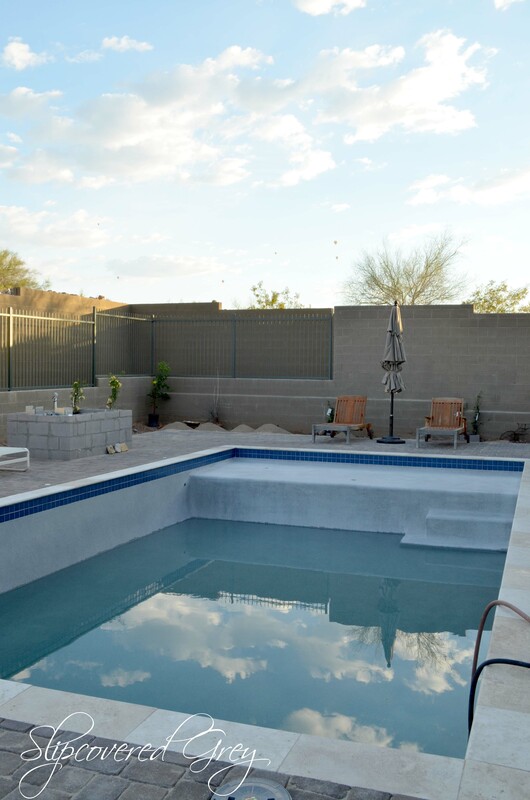 One where the kids could throw a ball back and forth and a pool with a couple relaxation areas. In our case it wasn’t just the pool. It was the entire backyard that needed work. A seamless backyard that had a nice flow was my desire. I drew my dream idea on paper so I could communicate my vision with others. 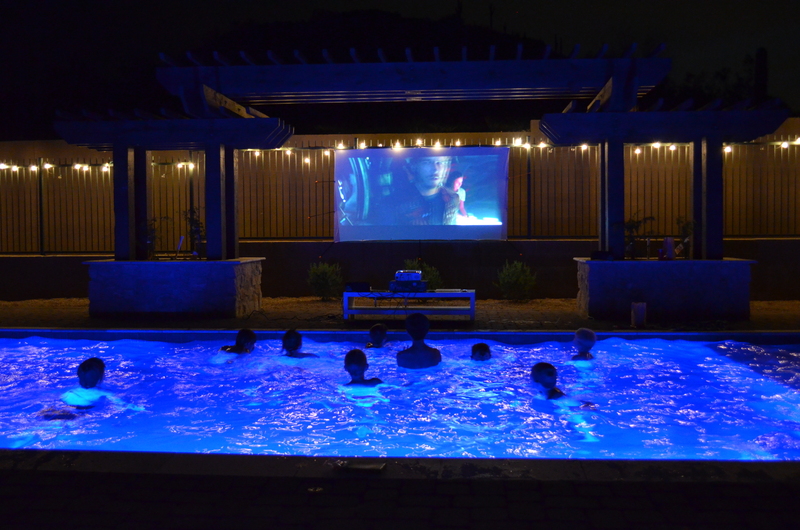 Pinterest (I have a board specifically for pools), and the list goes on. 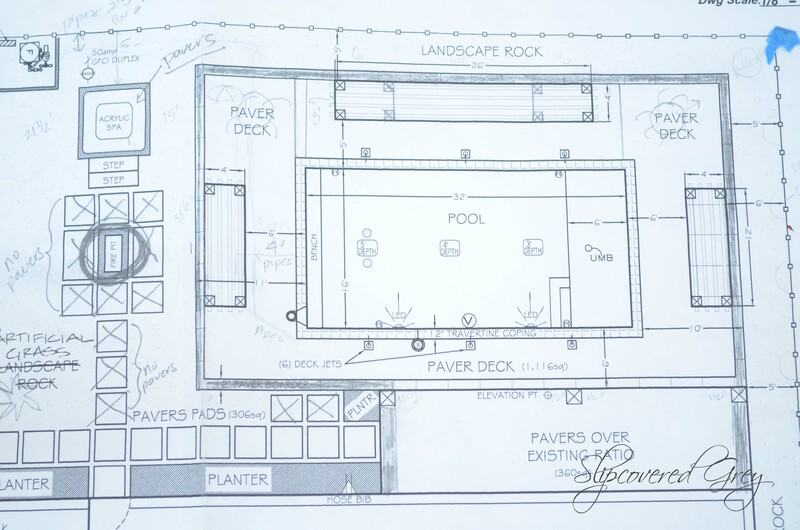 When we met with Build Your Own Pools they drew our plan to scale. This is the plan that everyone looks at. When it comes to the plan, double and triple check everything making sure it is correct. 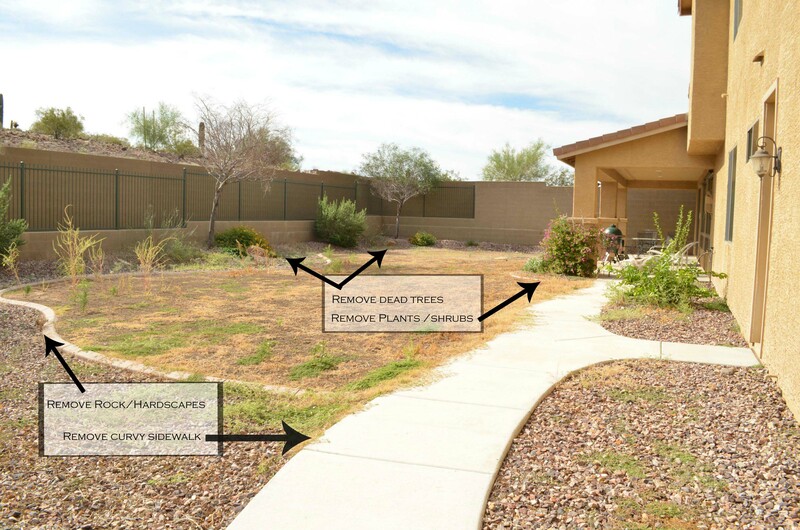 Being your own contractor you will be using your tape measure making sure everyone follows this plan to a T. We found it helpful to hang it outside so there was always a referral for everyone on the job site. (As you can see, I tweaked this plan and have a lot of chicken scratch). Lighting for inside the pool. We originally had one light drawn in our plan. Our next door neighbor mentioned he wished he had two lights. Immediately we changed the plan to have two. Believe me, it does make a difference. Relaxation spots. We chose a bench at one end and a Baja step at the other. Umbrella sleeves. This is a must for those who want to get out of the sun. We put two in the pool, but we wish we would have put one more in. Water feature. We chose deck jets, but there are many other options, such as waterfalls and scuppers. 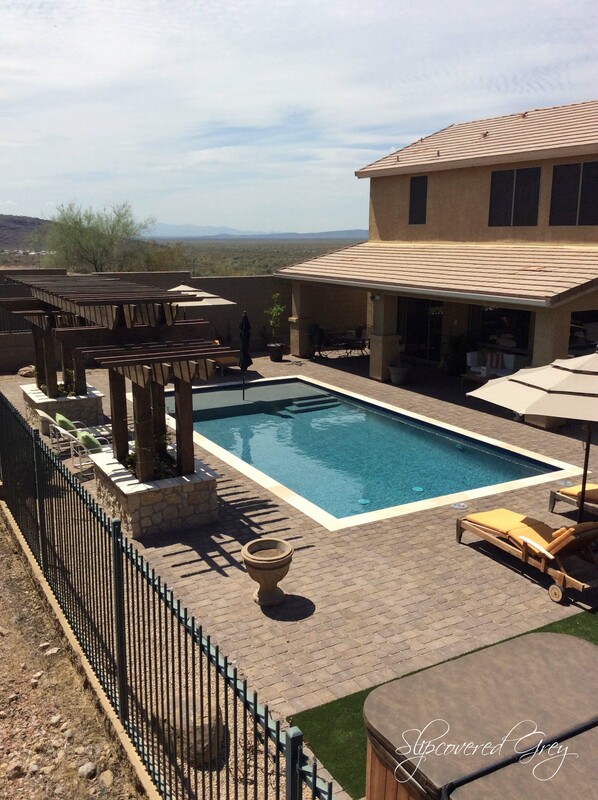 There is really a lot to think about, so thinking about how you will use your pool will really help when building a plan. Do you want a slide? Fire bowls? Eat in bar? the list goes on and on. Again, I wanted simple, so it was pretty easy. 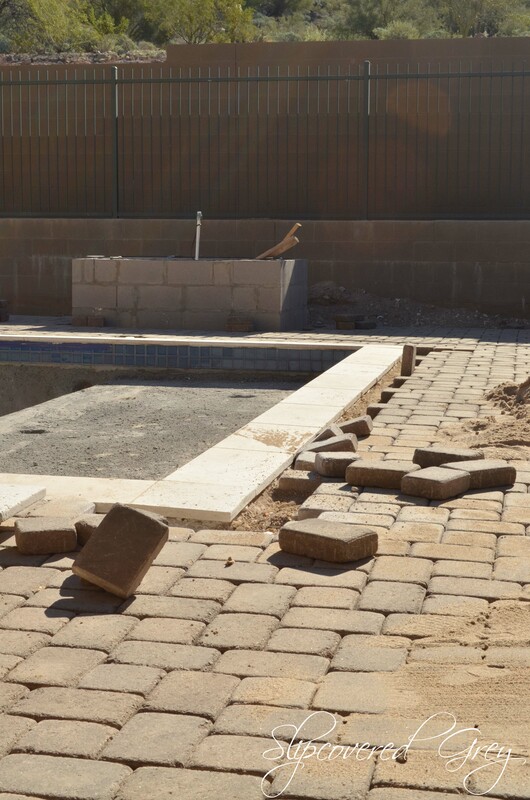 Once the plan was drawn up, Build Your Own Pools supplied us with a list of sub-contractors so we could hire the best and start our journey. The first step was scraping the property. 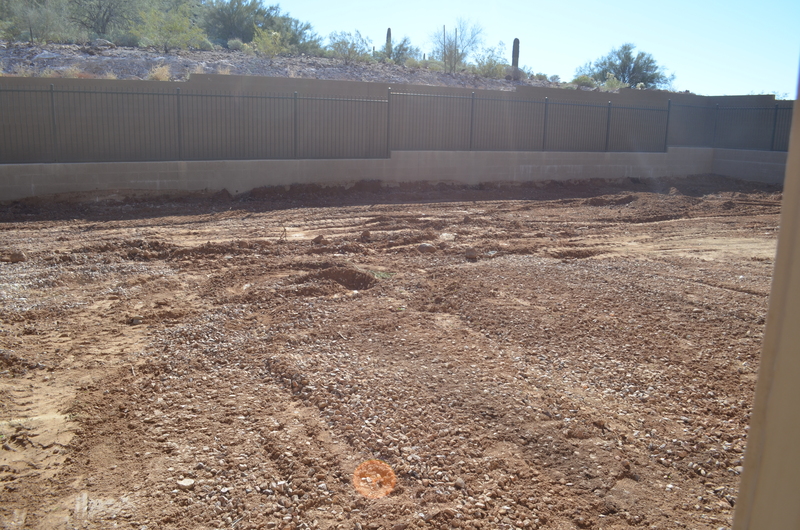 We took out the curvy sidewalk and flattened the entire back yard. It was crazy how much larger the yard looked after everything was removed. 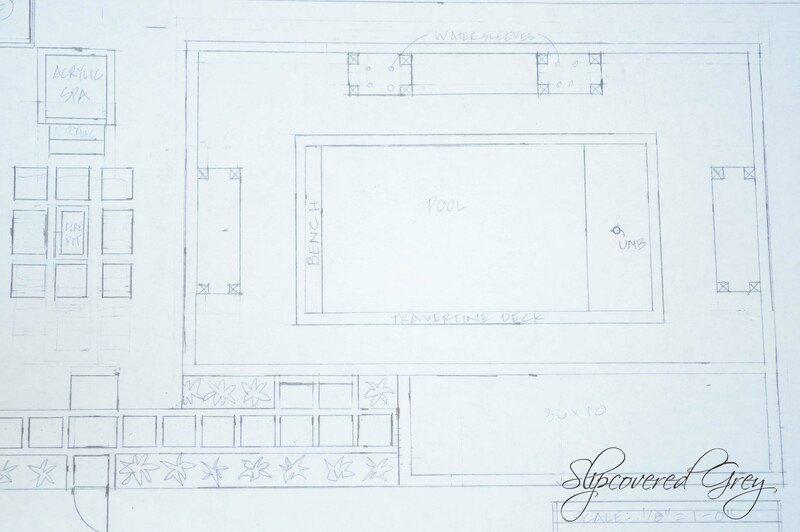 Next, the layout was painted which gives a template for the pool and digging. (Unfortunately, I do not have a photo of this). this is where you start to see the pool come to life. who knows what you will find. 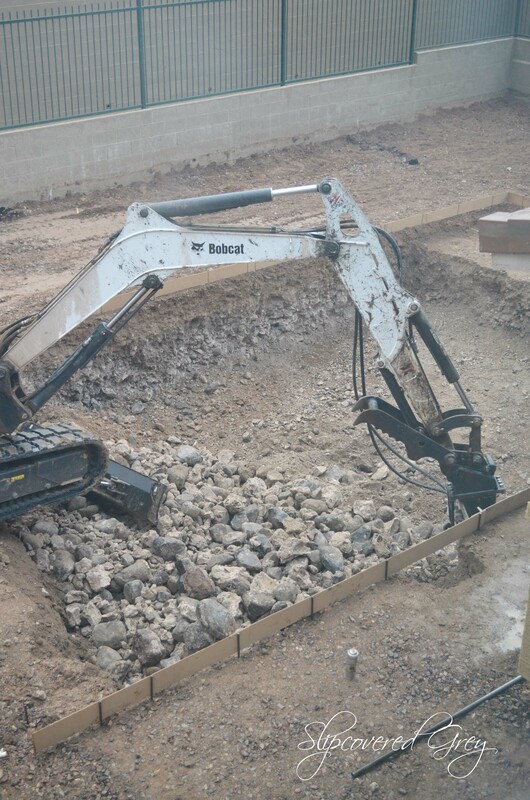 The excavators did end up finding some hard rock (caleechy), which needed to be jack hammered out. Which, of course, costs more per hour of labor. Luckily it was a small portion of the pool. 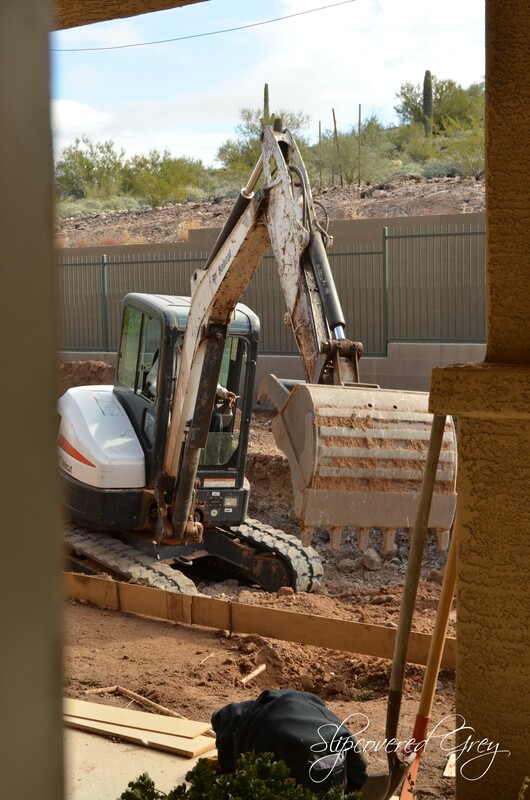 The excavators hauled away the dirt and rocks. 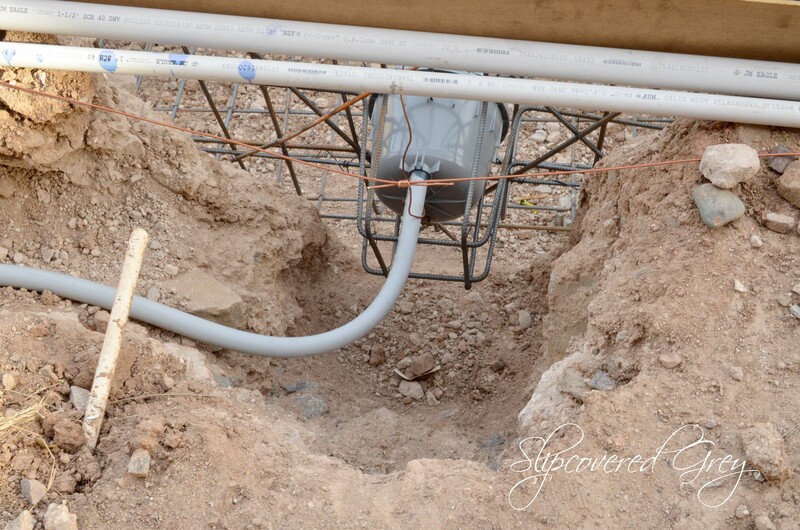 They left fill dirt to cover where the electrical and plumbing pipes run. They also paint where the plumbing pipes will be laid as well as light fixtures etc. At this point, there was no turning back. See before and after pictures here. Remember how I was going to take you on the pool building journey and wait to show after pictures? Well, I couldn’t wait any longer. Why keep you in suspense? If you wanted to see how we did it ourselves, don’t worry. 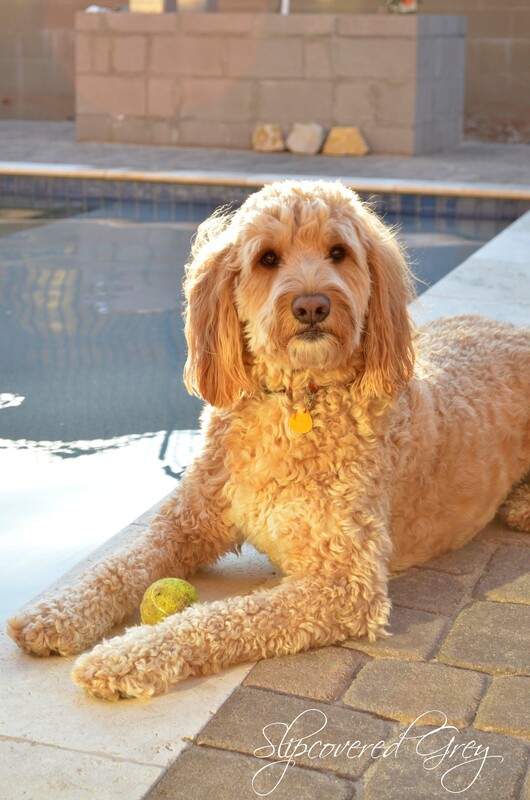 I’ll still take you through the journey, and if you are building a pool or updating a backyard, hopefully, this will help. It’s truly hard to believe it is the same backyard. This didn’t happen overnight, it took us about 6 months to complete. 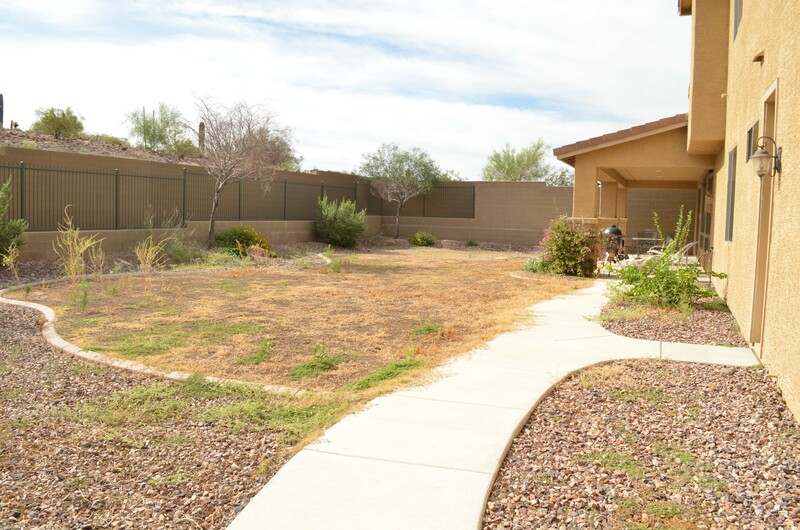 Landscaping is the next project. Confederate (Star) Jasmine will fill the entire back wall in hopes to make the wall camouflaged and disappear in time. The pergola will also be filled with flowers and climbing vines. It’s also the perfect spot for outdoor movies and birthday parties. (like the outdoor movie theater we previously created). 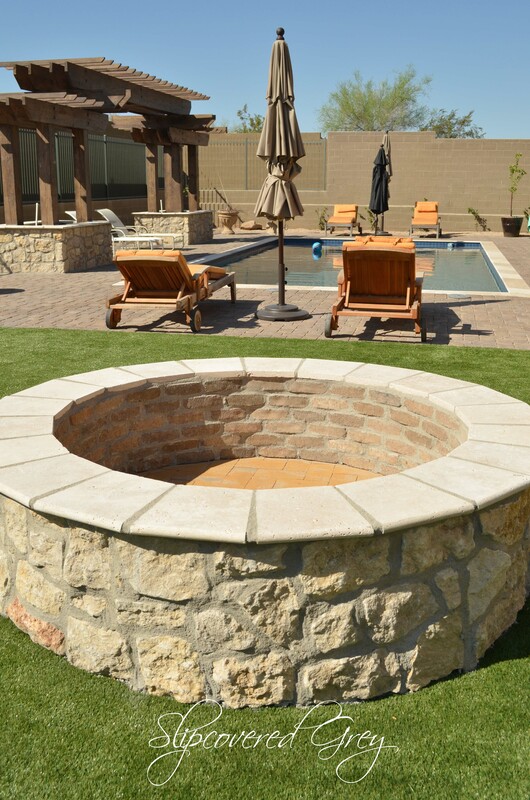 The fire pit… will be a place where we create many memories. surrounded by plenty of friends and family. 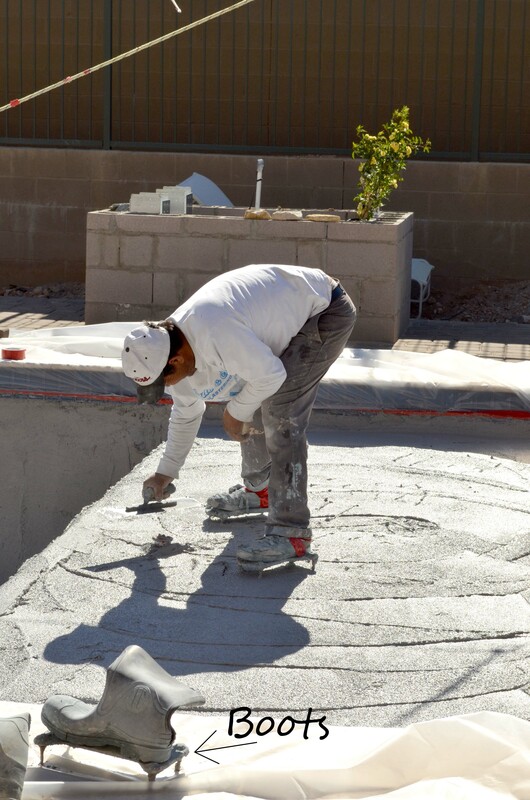 Are you in the process of building a pool or updating a backyard? what slowed us down, and if there is anything I would do differently. © Copyright 2017 Slipcovered Grey. All rights reserved.